The noTours project in Sint-Niklaas is selected by the EU as one of the finalists for the European Prize for Tourism and the Environment, rewarding original touristical initiatives bringing together the city and ecology (with the European meeting, alternative city walks in Sint-Niklaas by WIT and a noTours-walk). On July 23th an European jury comes to Sint-Niklaas to experience noTours and to listen to a presentation of the project. A Knocking bird is an urban and e-culture project with an ecological engagement, organized by Cultuurcentrum Sint-Niklaas, WIT Urban Team (www.wit-urban.team) and noTours (www.notours.org) in collaboration with the Colour U, several international sound artists and environmental and ecological organizations. Curator: Geert Vermeire. A “city sounds”-concert on the Day of Europe May 9th in the City Museum of Sint-Niklaas will present the Colour U. They will translate Sint-Niklaas and other European cities into sound with urban soundscapes. Via participation of the residents and contributions of the European visitors the project will focus on an aural experience of the city and on the creation of a soundwalk with an alternative and creative tour of the city. The soundscapes are loaded into an audioguide with gps and activated when you approach certain locations. Once you switch on the audioguide you only need to walk. You are surrounded by soundscapes which come and go according to your movement through the city. Available from the 15th of June till 15th of September. A project by the Cultuurcentrum City Sint-Niklaas with support of Grundtvig, Lifelong Learning Programme, Education and Culture, European Union. 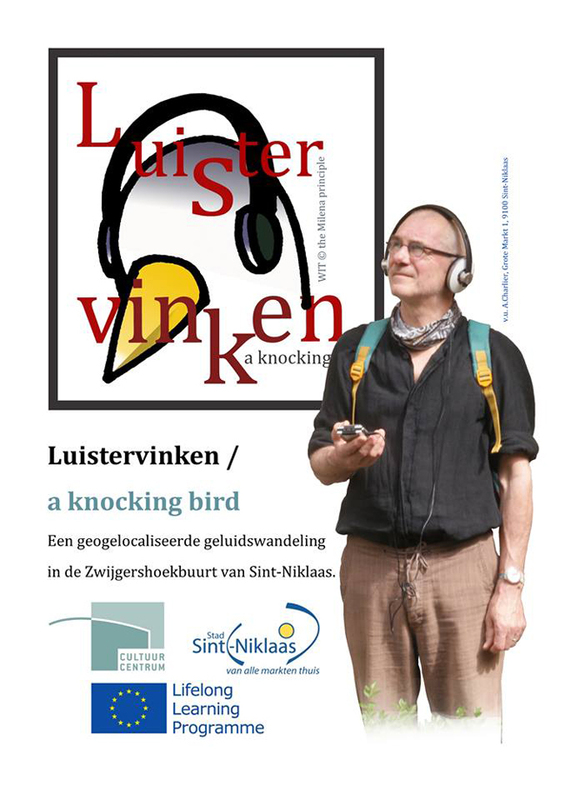 Within the framework of the project, A knocking bird, residents and European visitors to Sint-Niklaas are invited to explore the city in a search for nature, together with WIT Urban Team (www.wit-urbanteam.com) and with sound artists (www.notours.org) during a stay in Sint-Niklaas. At 7 pm – 9 pm: Welcome and informal dinner prepared by residents of Sint-Niklaas, members of the organization Volxkeuken . www.volxkeuken-sn.com Location: Lobby IBIS Hotel (departure) and Volxkeuken. 2 pm – 5 pm: Spaziergangwissenschaft (the science of walking), WIT Urban Team. A guided walk with members of WIT Urban Team and noTours. www.wit-urbanteam.com en www.notours.org Location: Castle Walburg (departure) and city center. 7 pm – 9 pm: : Cases of city participation projects with new media, webprojects and webmaps: www.miejscownik.org Lodz and www.dromenvandenatuurindestad.be - Luistervinken/a Knocking Bird Sint-Niklaas . Location: Vrije Ateliers. 10 am – 11 am: Cases from the home cities of the participants: Topografie Lodz www.topografie.pl (organization that brings together people who believe in Lodz and want to work for their city) and their open media- and web projects about the memory and residents of the city, created by the residents themselves. Location : Castle Walburg. 11.30 am – 12.30 am: Welcome and opening event for the European guests. “Spaces Between - Le Chant des Oyseaulx”, urban sound intervention for eight voices, inspired by a composition of Clément Janequin with WIT Urban Team, musicians Pieter Stas and Els Spanhove. Location : STeM (City Museum). 2 pm – 5.30 pm: Cases from the home cities of the participants: Atenistas Athens www.atenistas.org (citizen´s organization that brings together people who believe in Athens and want to work for their city), TRES Barcelona www.elsilencio.com (Silent actions : approaches to silence in the city of Barcelona), Escoitar.org Vigo www.escoitar.org (the use of sound and new media as a tool for participation, collective memory and cultural identity). Proposal to collaboration between the participants and the residents of Sint-Niklaas , divided in three workgroups, based on the cases. Location: Castle Walburg. 10 – 12.30 am: Reception by the Mayor of Sint-Niklaas. Location : Town Hall. 2 pm – 5 pm: Presentation “the Dürer connection”, a media project about travelling in Europe and urban actions in various European cities. www.themilena.com Workgroups. 10 – 12.30 am: New media in the city, techniques and technologies of sound recording. Location: Castle Walburg. 2 – 5 pm: Guided walk in the Silence Area Sinaai. Sound recording. Location: Castle Walburg (departure) and Sinaai (by bus). 8 pm – 10 pm: Public presentation of Atenistas and meeting with members of the citizen´s organizations Transitie and Solied vzw. www.transitie.be . Location : Masereelhuis. 10 – 12.30 am: Guided touristic walk in the city of Sint-Niklaas. Sound recording. Location: City Hall (departure) and city center. 2 – 5 pm: Guided visit to the new Mercatormuseum, museum about life and works of the cartographer Gerardus Mercator (1512-1592). Introduction to urban soundmapping. Location : Mercatormuseum. 7 – 9 pm: Presentation about and visit to WARP, organization that promotes contemporary art and culture in the Waasland region in an international perspective. www.warp-art.be Location: Restaurant Eigenwijs and Huis Buytaert. 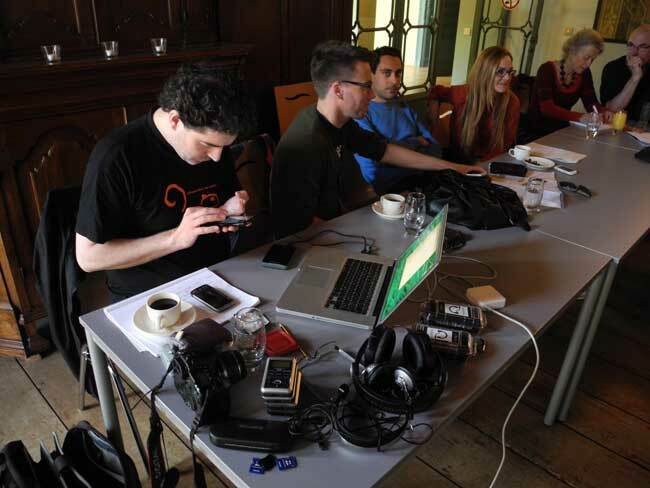 10 – 12.30 am: New media, editing sound and creating soundscapes. Workgroups. 2 – 5 pm: Collaboration with residents of the Westerbuurt area in an urban intervention together with WIT Urban Team and with Atenistas, in collaboration with Solied vzw. Location: Buurthuis Herleving, Westerplein 5 (meeting point) and Westerbuurt. 8 pm: Closing event and Europe Day concert “the listening city” by the Colour U, an European city sounds concert, with contributions of the European participants, and Blackout # 26, a performance that switches off the building of the City Museum, by the Spanish artist TRES, assisted by participants of the workshop. www.thecolouru.com Location: STeM (City Museum).